VANCOUVER — It's a feeling Canada hopes not to experience again for the rest of the 2019 IIHF World Junior Championship. 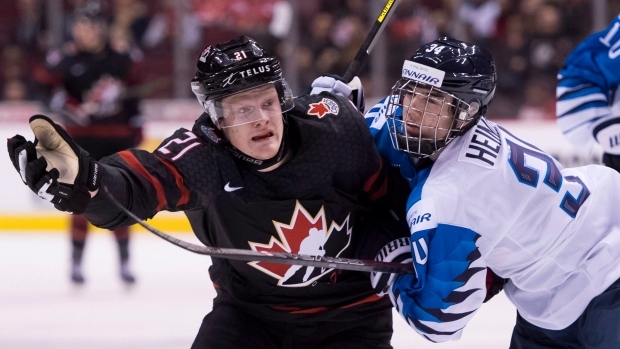 The Canadian team looked flat early and it proved costly in a 5-2 loss to Finland Sunday at Rogers Arena in Canada's final exhibition game heading into the tournament. "It's good to get it out of the way," said Cody Glass, the Portland Winterhawks centre who was picked sixth overall by the Vegas Golden Knights in the 2017 NHL draft. "We never want to have that feeling again. "We want to make Canada proud. It's a pre-tournament game but we have to treat every game like it's the gold-medal game. It's kind of unacceptable for us to play that way in front of our fans. We didn't play to our best tonight." Canada, the defending world junior goal medallists, open the tournament Wednesday against Denmark. Finland plays Sweden. Finland opened the scoring Sunday on Otto Latvala's pretty short-hand goal in the first period. The Finns also got power-play goals from Eeli Tolvanen and Anton Lundell to lead 4-1 in early in the third period. Linus Nyman and Santeri Virtanen, who scored into an empty net at the buzzer, notched the other Finnish goals. Kaapo Kakko, projected to be the No. 2 pick in this year's NHL draft, had two assists. Morgan Frost and Barrett Hayton scored Canada's goals on power plays. Glass had one assist. Head coach Tim Hunter said Finland played with an energy Canada lacked. "We didn't start the game with a sense of urgency," said Hunter. "The Finns had a sense of urgency to start the game, to compete and play physical. We were chasing the game from then on." Among Hunter's frustrations was his team's power play, which finished the night 2 for 6. "I liked the Finnish power play, they snapped it around, they worked quick," he said. "We didn't do anything to make their penalty killers work. I could have killed a penalty. "They have to have a sense of urgency to get into the game and make a difference." Vancouver Canuck prospect Michael DiPietro started the game in goal for Canada, stopping 13-of-15 shots before being replaced by Ian Scott at 8:55 of the second period. Scott stopped 8-of-10 shots. Ukko-Pekka Luukkonen stopped 31 shots for Finland. Finnish coach Jussi Ahokas said his team showed no fear against Canada. "I don't think we have to fear," he said. "We have good players on our team. It's not a thing for us Finns, we don't fear. "We want to play the puck and have bravery when we play it, so we don't start throwing it away and we can control the game." Finland went ahead 1-0 at 10:26 of the first period while killing a tripping penalty called on Urho Vaakanainen. Right winger Teemu Engberg showed some speed by pouncing on a loose puck, then slicing around Canada's Owen Tippett. He took a shot that DiPietro stopped but Latvala knocked home the rebound. A defensive lapse allowed Nyman to put the Finns ahead 2-1 at 3:49 of the second. Nyman brought the puck out from behind the Canadian net, then was left untouched at the side of the goal. He patiently waited then shot the puck over DiPietro's glove. Finland showed its poise late in the second period when Canada had a two-man advantage for one minute. The Canadians poured on the pressure, but the Finns weathered the storm. After winning it's first two exhibition games by lopsided scores the loss against Finland was a splash of reality for Canada. "It was a good test for us going into the tournament," said Glass. "Now we know where our game could be. "We're going to go over video the next couple of days and we are going to ready." If the loss was a teachable moment, Hunter hopes his players are quick learners. "The learning curve in the world junior tournament is very steep," he said. "We will have to learn from that experience in a hurry." NOTES: Canada outshot Finland 17-5 in the third period. … The Canadians thought they had scored with 3:12 left in the third but the officials ruled the whistle had blown. … Canada outscored its opponents 11-4 in its previous wins over Slovakia and Switzerland. … Finland beat Denmark 7-0 in its other exhibition game.